Zohar is the home of strictly orthodox Kosher products. 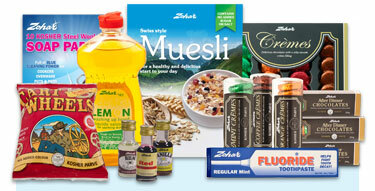 The range of products is mainly foods but also includes some Kosher household items. Superior quality at an affordable competitive price. The highest standard of Kashrus. – All our UK based products have the Hechsher of Kedassia London, with the exception of our Swiss-style muesli which is supervised by the Machzikei Hadass of Manchester. Our USA snacks (under the brand Zohar finest) are manufactured under the authority of the CRC. Full refund if not completely satisfied – no questions asked!! We are also looking to distribute in the UK interesting and novel Kosher products from around the world. If you have something to offer that may be of interest, please contact us TODAY. Quality House, 73 Windsor Road, Prestwich, Manchester M25 0DB, England.